Knitters have spoken! Single-skein projects are all the rage because they’re portable, fun, quick to finish, and the perfect answer to that stash of orphan yarns. Already, Judith Durant’s One-Skein series has delighted knitters everywhere with fabulous single-skein patterns contributed by yarn shops and noted knitwear designers. Create gorgeous sweaters, bags, afghans, and toys just by knitting the simplest of shapes—a square! 150 original block patterns, from simple textures to embossed pictorials, intricate lace to cables, colorwork, double knit, and more, all with Nicky’s signature wit, verve, and style. Detailed guidance for creating exciting pieces out of block knitting, without using increases or decreases. Cast on to novel new knits with exciting new patterns. Packed with more patterns than any one knitter can make in a year, the Knitting: 100+ Patterns Throughout the Year 2012 Day-to-Day Calendar gets rave reviews from those looking for value and new sources for patterns. 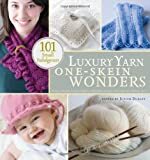 It features 117 patterns compiled from knit designers, local yarn shops, and yarn manufacturers, and provides Web addresses to sites with multitudes of additional patterns. * 117 new patterns provide clear instructions to make afghans, sweaters, scarves, whimsical toys, fashionable home decor, and so much more. Weaving is so much fun. Many knitters would love to dabble in the sport but don’t have room for a loom in their house. Table looms are the answer. The items you can make on a table loom are limited by size, but they are every bit as enjoyable to use as a large floor loom. Here is a good How-To video on the Schacht Cricket Loom. Real Oil, Real Brushes, Real Artist, Real Art! The Best of Interweave Crochet presents the very best patterns by top designers from the magazine since its inception. From Kathy Merrick’s color-rich Babette’s Blanket to Kristin Omdahl’s shapely Infinity Shawl to Lily Chin’s flattering Lace Dress, you won’t want to wait to get started on these popular projects and more. You’ll also find the in-depth instructions, tips, and techniques that you know and love from Interweave Crochet. Create bold new crochet creations using innovative variations on basic stitches and try your hand at more complex stitch motifs, Tunisian crochet, and lacework. The Best of Interweave Crochet is a complete collection of top designs all in one easily accessible volume. Whether you’re picking up a hook for the first time or you’re a long-time crocheter, you’ll love these twenty unique and popular projects.